From the tragic and depressing “Ran,” we move on to the film that makes me cry tears of joy every time. The strange mystery of life is that it can be simple yet complicated at the same time. Our struggles, dreams and the many lives that we touch make the journey perplexing, as we strive to make our time in the world matter, yet many obstacles stand in our way. But the joy of living is that the greatest enjoyments are always right there with us. Everything that we’ve accomplished stays with us, and the greatest pleasures are often the simplest to find. This is why I’ve always felt cinema has had a difficult time grasping what it means to live. To do so takes time, progression and a level of relatability to goes beyond being a character in a story, but a living breathing person. Few films have accomplished this, but the movie that does this best is Frank Capra’s “It’s A Wonderful Life.” This is one that goes beyond being a holiday classic, and becomes the tale of all men, aspiring to lofty dreams and end up creating something even better. 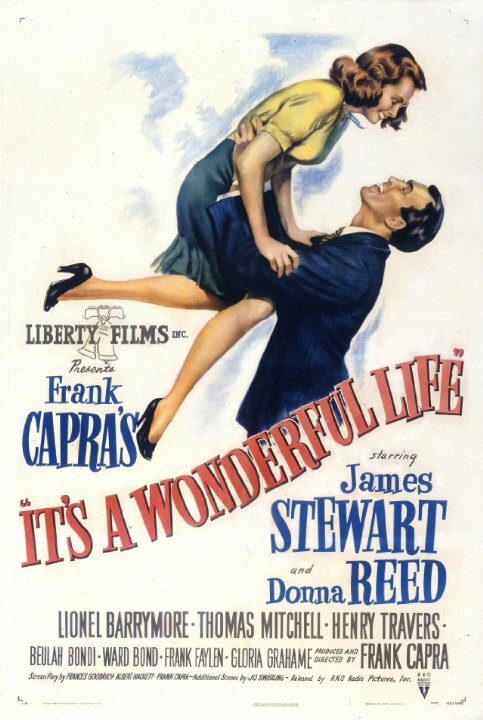 Frank Capra began working on this film immediately after World War II, intending to create something that all men and women could understand and smile about. Capra only ever had one person in mind to play the lead role, James Stewart, who had also gotten back from the war. In the end, they created a timeless fantasy that both Capra and Stewart had said many times was their personal favorite. George Bailey (Stewart) has spent his entire life in the small town of Bedford Falls, but from a young age had big dreams and goals of going out into the world and exploring its vast and magnificent wonders. But every time George has an opportunity to journey outside of this shabby hunk of earth, his giving and caring nature causes him to come back to these people. This is a man who feels trapped by walls of nickels and dimes, like a great eagle stuck in a tiny bird-cage. All he wants is to spread his wings and learn from the world. 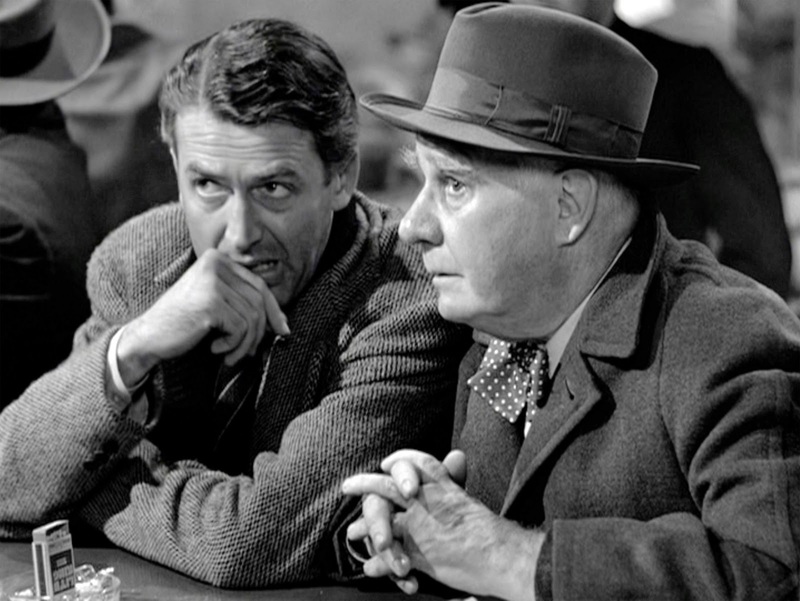 Bedford Falls is a town run almost completely run by one man, Mr. Henry Potter (Lionel Barrymore), who sees others as little more than dollars and a means to an end. If he doesn’t own it, his desire is to crush it so that no one can have it. But one establishment Potter can’t get rid of is the Bailey Bros. Building & Loan, started by George’s father, as a way to get the citizens of Bedford Falls out of the slums without crawling to Potter. 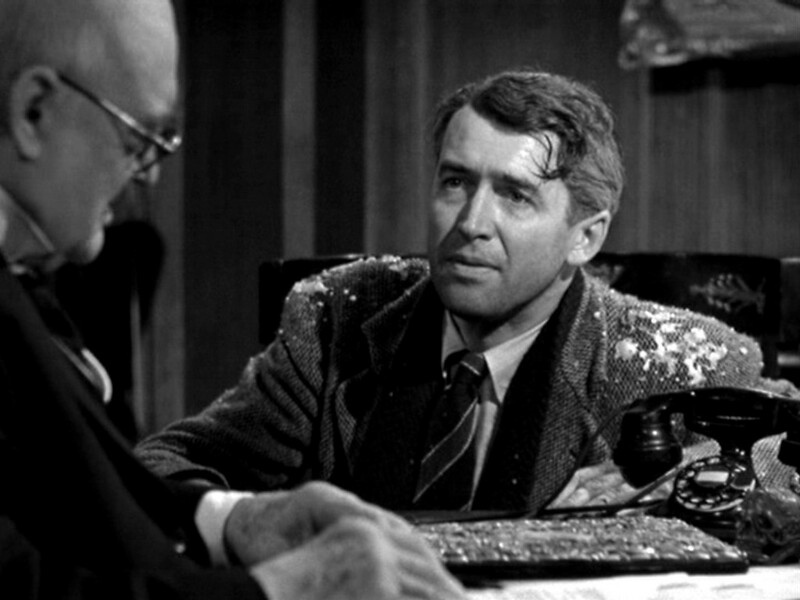 George’s father admits that Bedford Falls isn’t a place for anyone to live unless they’re willing to submit to Mr. Potter, who constantly calls the Building & Loans a charity ward for undeserving people. But the great thing about “It’s A Wonderful Life” is that, for the first two-thirds of the film, we get to meet these “undeserving people.” And not just a couple of citizens, but roughly half of the town. Ernie the enthusiastic cab driver, Burt the dedicated yet quirky police officer, Violet who likes to have a good time, Mr. Gower the owner of the drug store who loves George to death, Mr. Martini the foreign owner of the bar (shocking), the entire Bailey clan full of independent people not afraid to speak their mind, especially about Mr. Potter. There’s a slew more that we get to know intimately. This doesn’t feel like a collection of people living in the same area, but a town that has known each other for years. People who have grown up together, gone through loses together, learned from one another. It is a community that helps the lonely individual become more than he can on his own. Yet, as great as the town of Bedford Falls is, the best part of the film is still George Bailey, who I would have no problem saying is my favorite film character of all time. George has big ambitions about what he wants for himself, but over the course of his life, he realizes the grand scale of exploring the world is tiny compared to the world he has built in Bedford Falls. George is the definition of a selfless man. At the drop of a hat, he gives up his trip to Europe to keep his father’s establishment from falling into Potter’s hands. When he gets married to the girl of his dreams, Mary (Donna Reed), the two give up their honeymoon money after the Great Depression begins. George even gives his kid brother Harry all the money he had so that Harry could attend college, where he would meet his wife. George Bailey has many similarities to Marge Gunderson from “Fargo,” both are kind-hearted individuals who put others first, yet have a quiet strength that they must keep. The difference between the two is that Marge has found enjoyment of life’s simple treasures, while George never gives up on his dream to eventually leave Bedford Falls. In a way, that makes George a more relatable character – he is imperfect. He is frustrated with how his life has turned out, and never being able to leave his home town, no matter how hard he tries. At one point, George admits that he has every day of his life planned out, and none of that includes marriage or working in the loan business. George isn’t unkind about any of this, but it is secretly building up inside of him, waiting for the right moment to explode. Eventually, that moment does come. On Christmas Eve, George’s uncle Billy (Thomas Mitchell) misplaced $8,000 as the bank examiner shows up. George and Billy spend the entire day retracing his steps, destroying his office, to find nothing. In a moment of anger, George snaps at Billy, saying that one of them is going to jail and isn’t going to be him. He goes begging to Mr. Potter (who secretly has the misplaced $8,000) and Potter repays him by calling the police on George. As the night progresses, George’s frustration builds and all the slightly bad things in his life become big gaping problems, like the drafty house and his daughter coming home from school sick. After praying for help from God and getting punched in the face for his troubles, George considers taking a leap off the city bridge and ending it all. That is until his Guardian Angel, Clarence (Henry Travers), steps in. I mentioned this was a fantasy, right? George, still angered about everything that has happened tonight, begins to think that everyone would be better off if he wasn’t around. Like Potter told him, he’s worth more dead than he is alive. This leads to the now famous sequence of Clarence showing George what the world would be like if he was never born. In any other movie, this type of sequence would feel tacked on and forced. 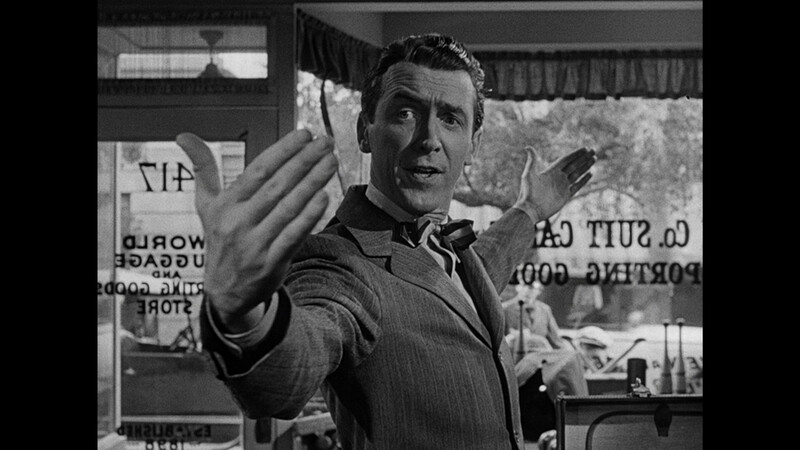 But in “It’s A Wonderful Life,” it is a necessary scene to demonstrate the theme of one man effecting so many lives. Plus, because we’ve spent the last hour and a half getting to know this town, the impact of seeing their dark and uncaring other halves hits us as much as it hits George. Our little family has turned bitter and ugly. It is at this point we learn how much of a caring and righteous individual George Bailey is. George saved his brother from drowning, and his brother would go on to save thousands of lives in WWII. By continuing his father’s work, George provided hundreds of low-income people with good houses. He created a family with Mary that will lead to several more generations of Bailey’s that will be instilled with his values. This isn’t the story of one man touching so many other lives, but how every person touches so many lives. Ultimately, this leads to the best part of the film, the ending. In my opinion, this is a perfect ending. I could watch the last ten minutes by itself and bawl my eyes out. If I watch the other two hours though, that only makes it worse, not to mention there are at least two other parts in the film that make me cry. Or it could be the film was building up to these last ten minutes. Showing George do these incredible things yet still remain an imperfect individual, spending so much time on the citizens of Bedford Falls, the sequence of showing George what everything would be like if he wasn’t born – everything has led up to this. 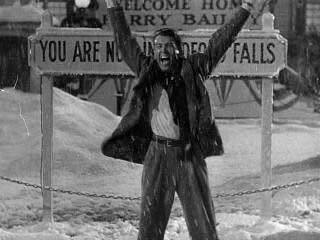 The point where Bedford Falls shows George that same kindness, to remind us that people are life’s greatest gift. 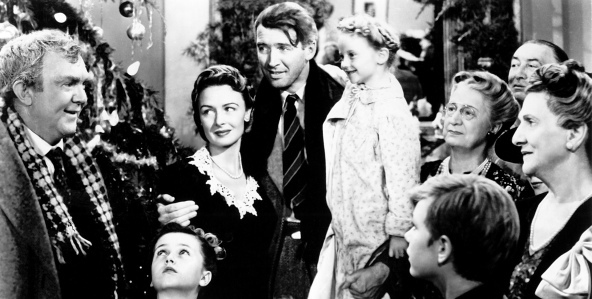 “It’s A Wonderful Life” is one of the very few films that speaks to everyone who watches it. Even if this film doesn’t make you cry or weep, there is still a connection to our need to improve the world. That if we strive for our biggest dreams, even if we don’t reach them, we still end up creating something to be proud of. It is a film, not about man, but about the individual. I absolutely love this film. I loved it when I first saw it as a kid and it has continued to hold deep meaning for me and engage me on every level in all the decades since.